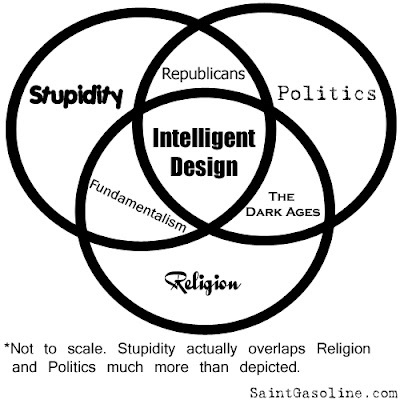 Here's a really funny diagram about religion & politics. I'm not sure that I agree with all of it... I would put democrats into the stupid-politics overlap along with republicans. Also, I don't think that fundamentalists have a corner on the stupid-religion overlap (or even that all of them fit into it). Still, I'm a sucker for a clever Venn diagrams, and this is one.